During the Newcastle poetry festival in May 2018, the Poettrio experiment held workshops introducing participants to their way of translating poetry. No knowledge of the source language was required, as each trio includes a language advisor who speaks both source and target languages. The source poet and a target ‘poet guide’ complete the trio. My group tackled a poem which begins ‘hela licht dat men werpt…’ by Hélène Gelèns, from her collection ‘Applaus vanuit het donker’. Disclaimer: I am not a poet, and I don’t know Dutch. The language advisor had prepared an ‘interlinear’ translation which we were given in advance of the workshop to help us access the poem. The interlinear notes key points and features in the source text. I found that despite my lack of Dutch, my knowledge of German was also helpful at times to give me a general idea of the meaning. My experience as a translator also helped me ask pertinent questions, such as how different the Dutch and English approaches to punctuation are. The creative aspect of the workshop, with all participants proposing suitable terms to use in the target poem, meant the Poettrio could pick up on suggestions they felt fitted particularly well. The group came up with a loosely agreed version; I suspect each person noted their favourites from among the many options suggested. More background on the Poettrios can be found here and in a recent ITI Bulletin article by Francis Jones (January-February 2019 issue, p.12). I did not use exclamation marks in the first stanza in English, since (as I understand it) their use is more ‘marked’ in English than in Dutch. Our source poet, Hélène Gelèns, has a background in astronomy: it was useful to know this when approaching her imagery. It helped us to imagine the poet’s perspective on ‘light’ and ‘darkness’ in relation to the sky beyond the earth. I feel as if the poem is written from a vantage point above the earth, looking down. The references to light also relate to modern life, with its artificial sources of light. hela licht dat men werpt in de nacht! heel wat licht om het licht! I may have introduced an ambiguity not present in the original poem. In my translation of the Dutch ‘verleden donker’ meaning ‘darkness of the past’, ‘past darkness’ could also be interpreted in the English poem as referring to the action described in the previous line: ‘cast / past darkness’. The novel, compound nouns in the source poem were reproduced in English, but I hyphenated them: I gather that running nouns together completely is rare in Dutch, but even rarer in English. The hyphenation aims to retain the novelty of the nouns while not making them more alienating for an English reader than the source nouns are to a Dutch reader. The source term ‘bewonderogen’ (literally ‘admiration-eyes’) was translated with what seems to be a cognate, ‘wondering’. ‘Wondering’ is also reminiscent of ‘wandering’ which often collocates with eyes in English. I felt this was in keeping with the sense of movement and agitation in the poem. It links the moving eyes to the light show they are ‘glued to’. During the workshop we discussed that, from the third line of the last stanza onwards, the poem refers to people in general (‘iedeeren’… ‘we’). I chose to indicate this by adding ‘we’ in some places where I felt that an impersonal construction, although more reflective of the Dutch, would not sound natural in English. I also used ‘our’, which (in informal usage) also reflects the familiar tone of the suffix ‘-jes’ in ‘stadslichtjes’. I chose two parallel texts to incorporate into my translation as a reflection of the Dutch children’s song referenced in the second- and third-to-last lines of the poem, and its echo in the last line. The interlinear translation advised us that ‘we gaan nog niet naar huis’ is a Dutch travel song for children, to keep them happy in the back seat of the car; the last line of the poem uses similar wording to say ‘we won’t be tired for a while yet’. These were ‘We Wish You a Merry Christmas’ and ‘We’re Going on a Bear Hunt’. I hoped that, when combined in this way, they would reflect some of the defiant mood, rhythm and subject matter of the Dutch song in the source poem (as I understand it). ‘We won’t go’ on its own is reminiscent of children refusing to go to bed. Both texts use ‘we’, which fits in with my use of ‘we’ earlier in the poem. I enjoyed taking part in the local ITI North East translation workshop in November. This is an annual event, organised by our regional group one year and Yorkshire Translators and Interpreters the next. Several students from Durham University also attended this time, working in various language combinations. We were very grateful to the university for hosting the event. Participants began by settling in and sharing a buffet lunch at the venue. For the second year running, a speaker launched the event by introducing the subject area. This year we tackled various texts in the fields of Art, Architecture and Design; I gave the introductory talk, with examples of issues I’ve encountered while translating in these fields. For the main sessions, we split into groups for each language pair and/or direction, including French, Spanish, Italian, German, Russian and Dutch. It’s often handy to have native speakers of the source language on hand to help with understanding nuances in the source text. The general rule for the workshop is that any language direction can be accommodated at the workshop, provided more than two participants sign up in advance. Everyone is invited to submit suitable texts to work on, and these are distributed beforehand so people can prepare them. Groups translating from English tackled a 1906 extract from Houses and Gardens by M. H. Baillie Scott about cottages. In places, the terms and concepts described were no longer in common parlance, such as a ‘scullery’ and ‘back kitchen’. More obscure still was the expression ‘carriage people’, apparently used to distinguish between people along class lines. Several terms used were also arguably specific to the UK, like the word ‘cottage’ itself. The texts selected all presented different challenges. For instance, the French to English group were set a source text ostensibly aimed at children visiting a museum; however, they decided that the content of the target text would need adapting to make it more readily understandable to children. As usual, a short plenary session at the end of the workshop enabled each group to feed back the insights they had gleaned while translating. I always find it interesting to hear how other groups have worked and what they have concluded. The plenary also received several suggestions for next year’s workshop topic. I look forward to seeing what YTI decide to tackle next, and to joining them. In December I spent a very productive week at Stirling University taking part in a group workshop entitled Traduire l’histoire. This was the first in a series, La Fabrique des Humanités, organised by ATLAS – Association pour la promotion de la traduction littéraire. The series brings together translators working in both language directions: a rare UK-based opportunity to discuss translation and more in French as well as English! It was interesting for me to find out more about the worlds of literary translation and academic history in France and Belgium. I gained greater insight into US English too, as the other 3 into-English attendees were originally from the States. The week included an introduction with Jörn Cambreleng of ATLAS on the Monday, and a talk by Dr Michael Rapport on the Thursday about ‘What historians want from translators’. We also visited The Pathfoot Press, a small ‘hand press’ printer based on campus. In the workshop sessions proper, 3 hours were dedicated to each participant’s text. With everyone having read and prepared the source texts in advance, this was an opportunity to really get to grips with the whole extract submitted. The proportion of time devoted to discussing the context, approach to take, and details of the text itself varied according to the translator and source material. The manuscript I’m working on is ‘history’ in the sense that it’s a primary source; all but one of the other participants were translating secondary sources. I was the only into-English participant approaching the subject from a translation background, rather than a history one (both tutors were experienced translators, and Siân Reynolds worked as a history professor too). The tutors and attendees provided lots of knowledge about history, methods and more for me to absorb. Hopefully the historians gained from the translation input too. I have found it pretty much impossible to sum up the experience, not least given the intensive nature of the study during that week and the variety of material we tackled. Suffice it to say that this was a mind-broadening experience, which also deepened my knowledge. And what a great opportunity to get to know my colleagues! I attended an interesting, varied conference at the end of September: Scots Write, organised by the Society of Authors. The event was held in Cumbernauld, and it was a treat to have sessions on writing, translating, marketing and technology within easy travelling distance, with keynote speeches from well-known figures from the world of publishing. While I can’t hope to capture everything I learned – especially from the useful sessions on ergonomics and combining writing with life – I hope to provide a flavour of the event. 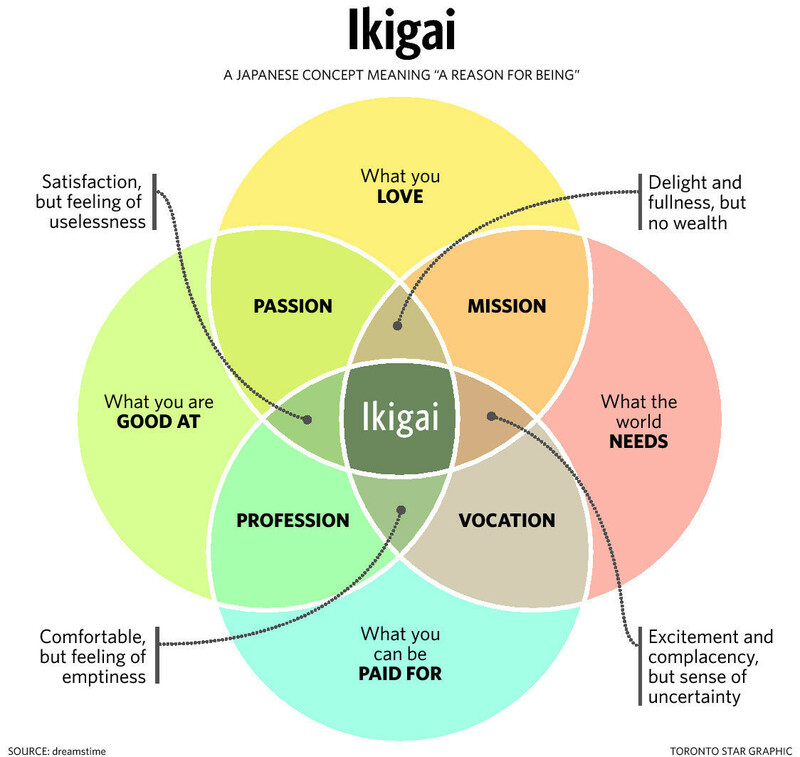 The conference was loosely themed around the concept of Ikigai, which is perhaps most easily illustrated using a Venn diagram. It is a way of balancing passion, mission, vocation and profession which can certainly also apply to translators. The first plenary session I attended was given by Jane Johnson, who described how her life had developed and shown her the path she now follows as an author. Jane introduced us to interesting ideas about writing, including thinking of writing as engineering. You may be afraid of causing an accident by changing something, but initial trial-and-error attempts can then be edited to make them safe, and new mechanisms that ultimately don’t work can be put back as they were. Jane also addressed the issue of cultural appropriation: is it appropriate for a writer to speak through characters whose cultural background they don’t share? She turned the question around, asking what would be lost if everyone only wrote about what they knew. She had looked into a family story about a kidnap from the Cornish Coast in 1625, tracing the Barbary pirates responsible back to Morocco. She thought it would make great material for a novel; a trip to the country for research brought her greater understanding of the people involved and their background (and triggered fascinating events in her own life). Indeed, several speakers at the conference mentioned that developing a sense of empathy with the characters you’re writing about is an effective way to avoid many of the pitfalls associated with cultural appropriation. This particularly sparked my interest, as I believe empathy is an essential component of the translation process, too. In order to reproduce someone’s words convincingly in a different language, you need to be able to empathise with the speaker. In a session aimed largely at non-translators, Ruth Martin and Daniel Hahn explained how translators produce ‘Exactly the same book, except for all the words’ in their talk on ​translating and being translated. They explained how translators can ‘make culture travel’ and promote ‘listening to one another’s stories’. One challenge literary translators face is to increase the proportion of translated literature sold in the UK, which currently lies (well) under 5%. In terms of illustrating the process of translation, Daniel Hahn provided a classic example of a translation constraint. This was also a great one to choose for an audience of authors: Georges Perec’s OuLiPo novel ‘La Disparition’. This book was written in French without using the letter ‘e’; Gilbert Adair translated it into English, also without using the letter ‘e’, (as ‘A Void’). This major, overriding limitation meant that many of the words, and indeed meanings, in the original French could not be transferred into the translation. Yet the translation did fulfil the same purpose as the original – it was also an exercise in applying this rule of ‘avoidance’. Session attendees also experienced translation constraints as part of a practical exercise. These were images and rhymes in the children’s picture book Daniel had brought as a sample source text. On one page, a set of ‘before’ images were described; on the facing page, a set of ‘after’ images were also described, in language that rhymed with the ‘before’ descriptions. The nature of the book meant space was limited to one or two words for each image. This shows how inventive translators may need to be to meet their translation objectives! Another successful illustration of the difference word choice can make was the first line of Camus’ L’Etranger, ‘Aujourd’hui, maman est morte’. This has been much-discussed, and it clearly makes a difference to the tone of the opening whether ‘maman’ is rendered as ‘my mother’, ‘maman’, ‘Mummy’ or ‘Mama’ (which can be read as if it’s pronounced ‘mumma’ or ‘mahmah’, both with different connotations). Even brief examples can provide plenty of food for thought! My ITI Conference was jam-packed with impressions; here are some short snapshots of events I attended. Karen M. Tkaczyk provided a thorough and knowledgeable insight into one strand of her work, editing non-native English. As in all areas of this business, managing customers and their expectations comes into play. Karen finds it useful to ascertain whether the writer she’s editing is likely to welcome – and learn from – her explaining the corrections she makes. This saves time all round, as she doesn’t explain to people who won’t listen, but does benefit when receptive customers learn not to make the same mistakes in their next paper. Alison Hughes provided many helpful ideas for the translator faced with a creative text, including an emphasis on lateral thinking. Flow and style are paramount, and liberties may therefore need to be taken with the individual words. Thus you might end up searching for the right-sounding word, or one that fits with the other words used: there are websites to help you find rhymes or words starting with a certain letter. Alison’s co-presenter Adriana Tortoriello helped me think of a creative text as multisemiotic, a combination of verbal and visual meaning. In this context, the visual aspect of the words is also important: you might say that in an advert, typeface is to text what intonation is to speech. And tone of voice is key to conveying the ‘personality’ (e.g. brand) which the source text embodies. Again, translators need to ascertain the level of work customers want – a new lick of paint for their vehicle, or a complete overhaul? I was intrigued by the idea of the ‘TED-style’ talks, new to Conference this year. I heard Richard Davis speak about whether agencies (like his, winners of the ITI Corporate Member Award) are ‘servants of the dark side’. He deliberately defied expectations, and showed the added value agencies provide from an unexpected angle or two. After asking the audience what they thought the ‘point’ of agencies was, Richard explained his view. I found it interesting to note that agencies build up experience through the sheer volume of jobs they handle, and that experience is retained even when individual employees move on. This enables them (in theory) to foresee and help pre-empt problems. Similarly, agencies with several in-house employees can dedicate resources to managing terminology and other repositories of knowledge which can help achieve the best translation. I was a Singing Translator once again this Conference. For anyone who missed the show, a video is available here (or search for ‘ITI Conference Day 2 916’ on YouTube). Please note the pun inherent in the choice of song: ‘Memory’ from the musical ‘CATs’! Here’s an article written for the ITI’s Scottish Network on a renewable energy industry event I attended. Among other information, I gathered a useful overview of developments in Scotland and in UK policy. This event was held by the British Chamber of Commerce in Germany in 2013, against the backdrop of an impending Scottish Independence referendum. It’s interesting to look back on the uncertainty in the UK constitutional, political and policy landscapes which even then was said to be affecting business prospects. The Chamber is now holding events to help its members prepare for Brexit, including one in London on climate change and emissions trading.